1. 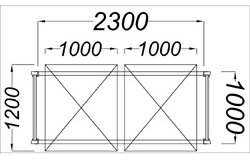 How to determine the width and depth of pallet racking? 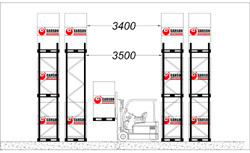 The width and depth of racking is determined by pallet size and its entry side. Four-way entry pallets permit entry of forks at each side. Two-way entry pallets only permit entry of forks from two opposite directions only. The use of 2-way entry pallets will restrict the direction you place the pallets on the racking. Make sure the pallets should overhang beams at least 50mm to 100mm at each end. 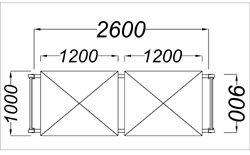 Clearance of 70mm to 100mm should be allowed between adjacent pallets and pallet and upright. 2. How to decide the beam level? The beam level is dictated by the height of your palletized load. They height of your palletized load is the sum of the height of your goods and the pallet itself. In order to enable the lifting action of forklift, in general, clearance of 100mm should be allowed between the top of the load and the underside of the beam. 3. How to determine the height of racking? Firstly, the height of the top beam should not exceed the maximum reach of your forklift truck. Secondly, the height of the building determines how high you can store your goods. When deciding the height of the top beam, make sure there is enough space between the uppermost pallet and electrical conduits, pipes, sprinkler heads and light fixtures underneath the ceiling. For sprinkler system, it is recommended that at least 300mm clearance should be left so that water can be thrown far enough to extinguish fire. 4. How to determine the aisle width? The aisle width is the distance between racks. In real case, we always have to consider the “working aisle” width which is the clearance between palletized goods after put on the racking. The aisle width is determined by the turning radius of the forklift truck. Counter balance forklift truck requires wider aisle than reach truck. Counter balance forklift requires wider aisle than reach truck. Manufacturers of forklift normally have recommendations on the minimum aisle width. For actual layout design, it is advisable to increase that figure by approximately least 200mm. 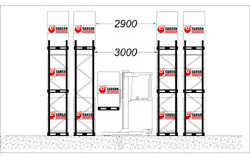 Generally speaking, a counter balance forklift of 3.0t capacity needs approximately 3500mm to operate. The aisle width is also affected by pallet size. The bigger the pallet, the bigger the aisle is required.